I love the sales after Christmas as you can pick up lots of beauty goodies generally with a third off or half price. I made one sales purchase online on Christmas Day but that hasn't arrived yet so I'll post about that when I get it. For now I thought I'd show you all of the purchases from the last two days. 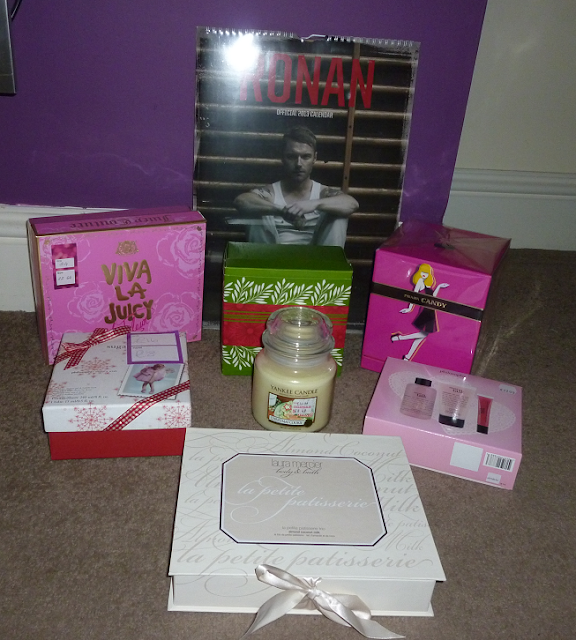 I mainly bought beauty related items with a few other things thrown in. The clothes shops were a nightmare so I didn't really look in those! Prada Candy is a relatively new perfume as it only came out last year. I bought myself a set just before Christmas 2011 and I absolutely loved it. I was gutted when it ran out but it's pretty expensive so I didn't end up replacing it. Leading up to Christmas this year I knew this was going to be one my sales purchases as I've missed the scent! I got this from Boots reduced from £53.00 to £35.33. This is the 50ml eau de parfum and it comes with a free 75ml body lotion. I only had the 30ml perfume last time so this should last a lot longer, yay! 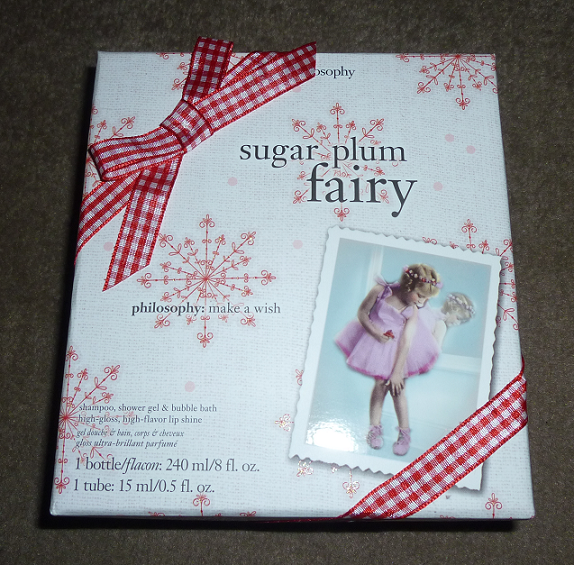 This Sugar Plum Fairy set caught my eye first as it contains the most gorgeous purple sparkly products! There is a 15 ml high-gloss, high-flavour lip shine and a 240ml shampoo/shower gel/bubble bath. I love these lip glosses as they always look so pretty, they aren't sticky and they smell delicious! I love the shower gels too as they have the most lovely scents. I actually prefer getting the small sizes rather than the large bottles as I get sick of the same fragrance after a while! This set was reduced from £16 to £8. There was a great selection of reduced Christmas Philosophy products in Debenhams, I was really impressed. I only bought one other set though and my choice was Sweet Talk. This set comes with a 120ml shampoo/shower gel/bubble bath, 60ml body lotion and 15ml lip gloss. This one was reduced from £22 to £11. I decided to browse the Origins counter to see if there were any good skincare sets like the one I got for Christmas. I would love to try their masks so I was hoping they would have the mask trio but I haven't seen that anywhere! Something else caught my eye instead though. I really like ginger scented products and I fell in love with this perfume after one sniff! It's a beautiful mix of ginger with citrus. It's a generous 50ml size. Also included in this gift is a 100ml body wash and 100ml whipped body cream. I am going to smell amazing! I paid £22.67 for this set. I think it had a third off the price but I can't remember for sure. My last purchase at Debenhams was another perfume set. A while back I had a quick spray of this Viva La Juicy La Fleur by Juicy Couture and really liked it so I kept it in mind for when the sales were on. 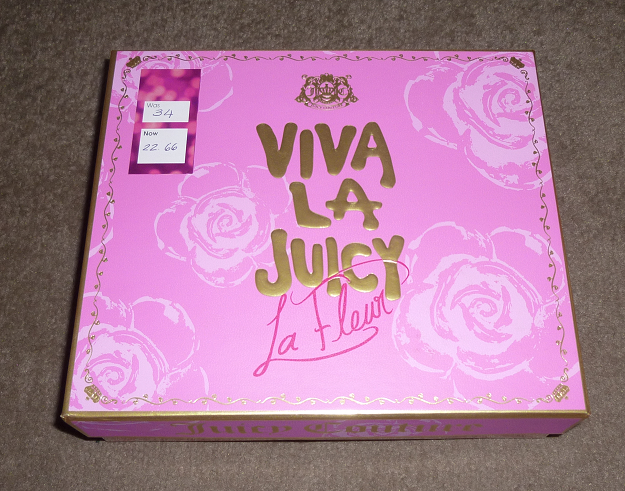 This is a lovely floral perfume and I love the way the set comes with a free rollerball of the La Fleur and regular Viva La Juicy fragrances rather than a body lotion as I think I will get more use out of this. It will be so handy for carrying around in my handbag. This set was reduced from £34 to £22.66. 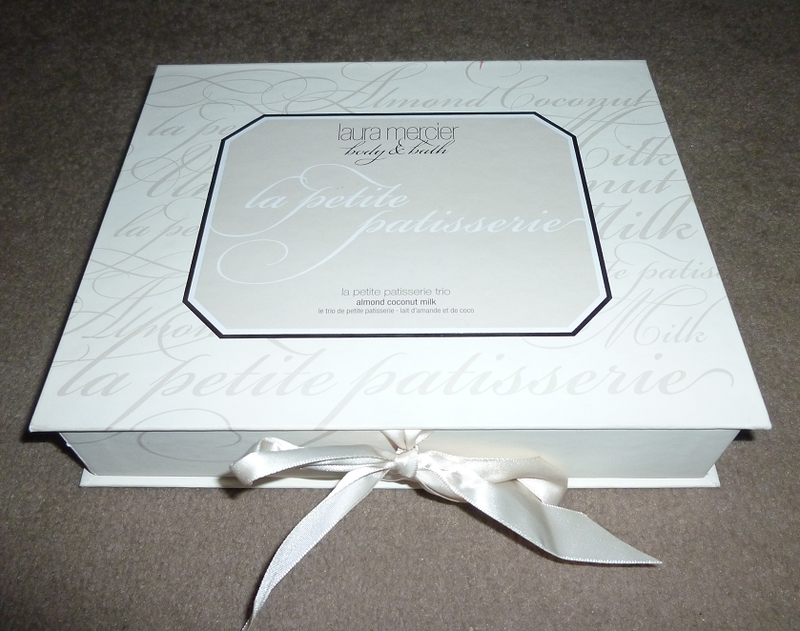 My final beauty purchase was from Space NK and it's this gorgeous Laura Mercier La Petite Patisserie Trio in the fragrance Almond Coconut Milk. I've seen a few bloggers with these sets and it made me want one! Ideally I would have chosen the Creme Brulee scent but there weren't any. This is still a delicious scent though. I haven't tried any Laura Mercier Body & Bath products before so I'm looking forward to some indulgent pampering with these goodies. The set contains a 15ml bottle of the fragrance with a 90ml body wash and 85g body creme. This was reduced from £40 to £20. 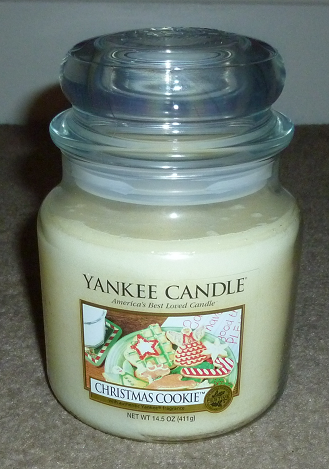 I really like Yankee Candles but I find them quite expensive so I normally buy the samplers but when I saw this medium glass jar going for half price at Collectables I had to grab it. It was only £8.49! Such a bargain! I absolutely love the sweet, vanilla based scent. Mmm can't wait to use this! I saw some half price candles at Clintons Cards as well and I was very tempted to buy more but I decided to save my money. This last purchase is a bit of a guilty pleasure! 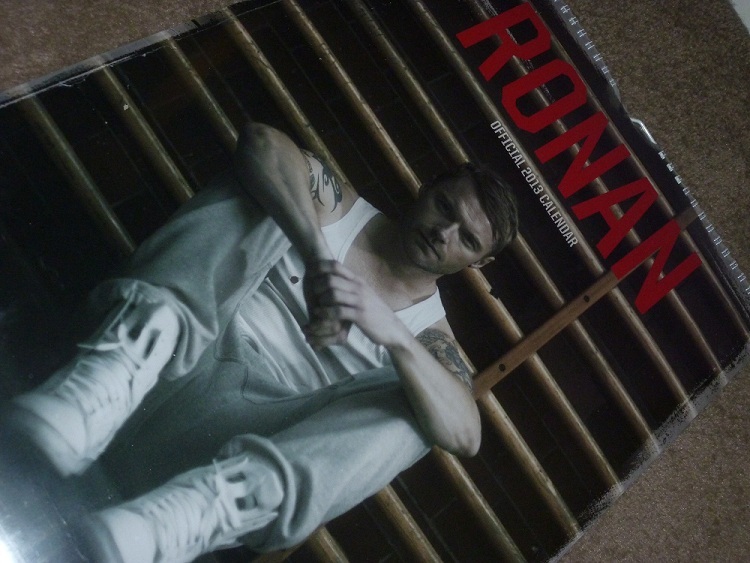 I absolutely love Ronan Keating so I picked up his calendar with 40% off at The Calendar Club. It features some very nice half naked photos so I'm not sure where I'm going to put this as I don't think it's something my fiance will want to look at every day but I'm sure I'll find a place for it! I'm really pleased with my haul as I think I got some great bargains and it's stuff I will definitely use. I had to resist getting the Sugared Apple Large Jar today for £10, WHY DID I NOT PICK IT UP?! I got the Christmas Cookie and Sicilian Lemon tealights instead though, so at least I didn't miss out. I picked up the Prada Candy set with my Boots points too, I feel so good for saving them up now that I got to buy myself something so nice! I love origins ginger body souffle, bargain on this set! You have some lovely sale items Suzy :D I did all my sale shopping online and ended up spending more than I intended too on both sale and non sale goods lol. Wow, you got some amazing bargains! So many tempting products, will definitely be looking for some of the philosophy sets.